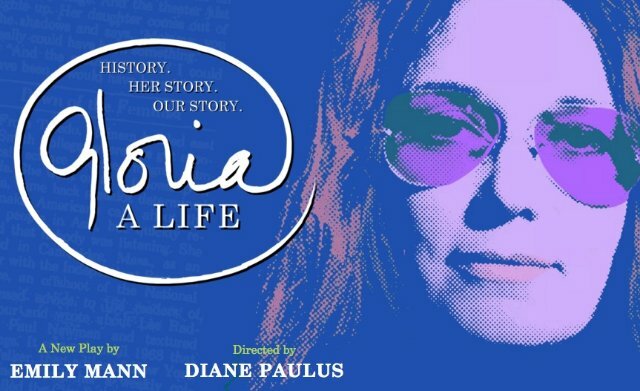 Gloria, A Life, by Emily Mann is playing at the Daryl Roth Theater in Manhattan. The theater is configured as a circle of bleachers. Gloria Steinem, whose role as journalist and activist in the women’s movement is the subject of this event, has come to believe that people, women and men, sitting in circles and talking, is the answer to humanly rich and fulfilling lives. Christine Lahti is Gloria, a feisty woman who has been plagued by a lifelong lack of self esteem and often uses her own issue to connect with others. Women she meets along the way like Bella Abzug inspire and empower her. Two aspects of this participatory history, well-directed by Diane Paulus, are particularly noteworthy. The audiences are engaged as part of the drama from the moment we step into the circular seating. Throughout, actors move through the audience and invite their embrace. At the conclusion of the evening, the theater’s large circle becomes a place for the audience to actively join in. Two stunning actors playing multiple roles include Joanna Glushak as Bella Abzug and Patrena Murray as Flo Kennedy. Black women are often not credited with the significant contributions they have made to the movement. Women’s understanding of the role of economics and also child-rearing has been clear to black women for a very long time. They have so often done this job alone. It is mistaken to think that this is a desirable form of child-rearing, but the experience is crucial for understanding women’s domestic roles. Dorothea Pitman Hughes, who started child care centers, joins Gloria. So too does Florynce Kennedy. Steinem herself appears at the show’s conclusion and leads the talk-circle. Her presence is a reminder that she is a very pretty women with a feminine demeanor which helped her overcome resistance from male power headquarters. The fact that Steinem was 66 when she married and never had children contributed to the amount of time she had available for the movement. At one point, she did take a young woman under her wing when the woman’s father left home to marry Diana Ross, but that’s not quite the same as being faced with the care of an infant. This absence of domestic commitment impacts her view of what many women want from life which is often partnership and children. One woman speaking from the audience said she had been brought up by a single parent and was now rearing a child alone. This is not good news. Videos used throughout are lively and help us to be present in the movement. Issues like women being able to dine in the Oak Room of the Plaza Hotel and most important, women’s right to control their own bodies, are woven through the show. Steinem successfully started Ms. Magazine, which launched as an insert in New York Magazine. Women are no longer an insert thanks in part to the actions of Steinem. Steinem's political astuteness was revealed in the last moments. When asked what she feared most about the state of our country, she noted the constitution of our State Legislatures. Here our own Constitution is threatened. This show sits in well with women’s current anger over reproductive rights and sexual assault. We would do well to listen to Steinem's message about politics too.